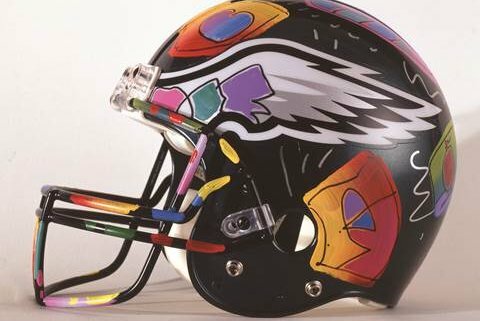 "The Philadelphia Eagles have such a bold and wonderful logo, I really love painting their helmets," said Peter Max. Peter Max will make an appearance at his gallery show in King of Prussia this March. The artist, known for his use of vivid color, became a household name in the '60s. The pop-art icon's psychedelic graphics and flower-child characters famously captured the era's counterculture movement. Since Max's debut on the art scene, he has churned out thousands of works which have been seen everywhere from the pages of magazines to the outside of an airplane. He's been the official artist of many major events, including five Super Bowls, and has hand-painted unique NFL team helmets and footballs. He also designed key art for NBC's music competition show "The Voice." Max will be at Wentworth Gallery at The Court at King of Prussia Mall on Saturday, March 3, from 6 to 8 p.m. Collectors will be able to shop for art and fans will be able to meet the artist.